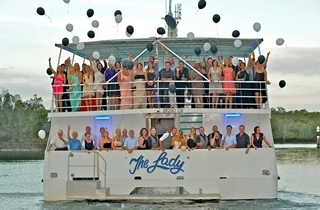 With your comfort and happiness always to the fore, the wedding packages on ‘THE LADY’ are carefully thought out and designed to be stress free, allowing you to relax and enjoy the most wonderful , amazing day of your life! 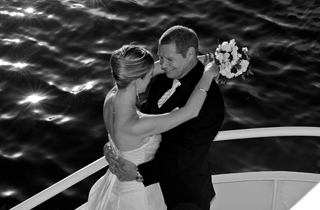 Whether arriving at Marina Mirage for your wedding ceremony or transferring from an alternate location to your reception on-board 'THE LADY', your experience of a lifetime begins (or continues). 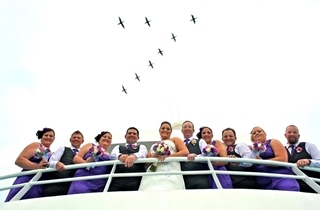 If being married on a beach, in a park or in a church, the Bridal Party will remain after the ceremony is concluded to accompany our award winning photographer to record their special day. Guests are free to make their way to ‘THE LADY’ a short stroll away, for pre-departure drinks and a selection of complimentary canapés served by our professional, courteous and friendly Wait Staff. 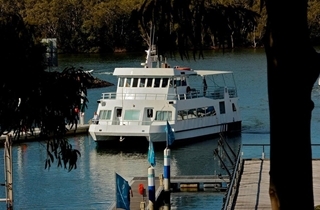 ‘THE LADY’ allows one hour for boarding. 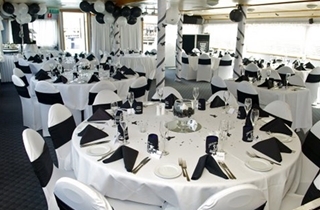 Imagine your wedding ceremony being performed on the upper deck under cover whilst moored at the marina, with the lights from the Marina Mirage complex as your backdrop. 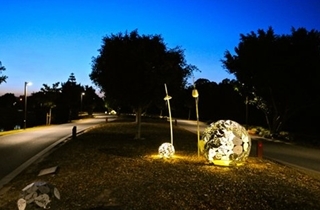 Here the views are unobstructed, the sunset superb and the professional staff attentive. 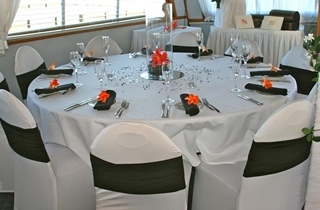 The upper deck is dressed with elegant white bows to accompany the wedding pews and Hollywood style red carpet. 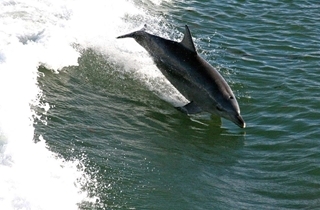 Once everyone is aboard, the fun begins! After a warm introduction by our resident MC and to resounding applause, the Bridal Party enters the beautifully decorated, intimately lit reception room. Once seated, a sensational meal is served. Pre-chosen by the Bride and Groom from five-star menus put together by our executive chefs, guests will be served an alternate drop of two mouth-watering entrees and two delectable mains. 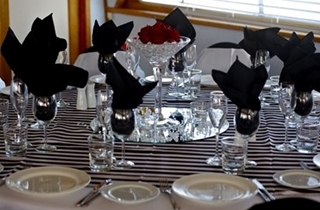 Alternatively, we also offer traditional or seafood buffets. All produce is seasonally sourced and is freshly cooked onboard on the day. After the cake has been ceremoniously cut by the Bride and Groom, it will be served with berry coulis and cream, or strawberries and cream, as dessert. Throughout the evening our resident DJ and singer will amaze and delight you with his expert and instinctive selections of music. As MC, his timing of proceedings is impeccable. Add to this his observant sense of humour and a fun night is to be enjoyed by all. 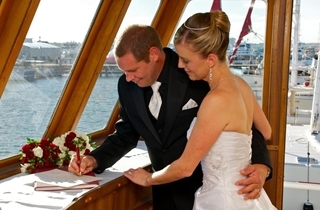 At the end of a wonderful evening, your return stretch-limousine awaits to deliver you in style to your Gold Coast hotel destination, for your first night as Husband and Wife. -Interior design professional for tables and colour themes. 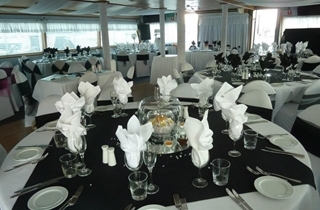 -One hour boarding for your guests-apon arrival your guests will be served a selection of canapes. Three course or buffet dining experience(select from our menus).The menu of your choice will be supplied fresh on the day and cooked on boardby our qualified Executive Chefs. 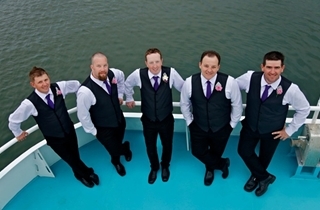 -Our very popular and professional MC/DJ/Wedding singer. - 4 hour beverage package,including beers,wines,champagne and softdrink/juices. 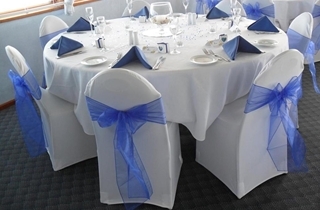 -All tables have white linen cloths and napkins, our chairs are dressed in whitewith yourchoice of coloured sash,floral centre pieces tea lights,skirted bridal table,gift and cake tables and our complimentary wishing well.